Between Avignon and Orange, superb Manor dating back to the Middle-Ages, and extended in the 19th century, over approximately 5,000 m² of grounds, accessible via a majestic and century-old plane trees alley. The numerous other plane trees on the grounds provide welcomed shadow during the summer months. - On the ground floor: independent kitchen, 4 large living rooms, all with period fireplaces, trims and cement tiles. - On the 1st floor: 4 bedrooms with “tomettes” flooring (typical Provence red tiles) and two shower rooms. - On the 2nd floor: independent apartment, with kitchen / living room, sitting room, bedroom and bathroom. - On the ground floor: independent kitchen, 3 large living rooms, all with period fireplaces, trims and cement tiles. 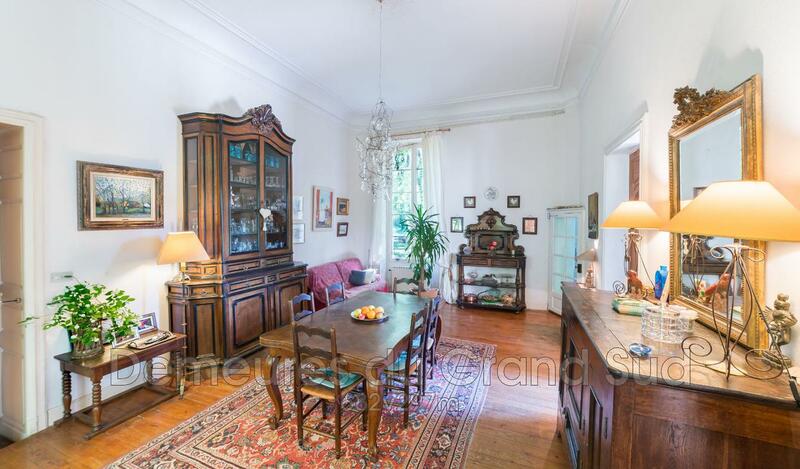 - On the 1st floor: accessible via an impressive entry hall and staircase. Includes 2 bedrooms with “tomettes” flooring, a large bathroom, and two oher large rooms also with “tomettes” flooring. - On the 2nd floor: to be renovated. It includes 2 large romms and 4 smaller rooms, all with “parefeuille” flooring (typical Provence clay tiles). Rare property in Provence, with great potential and of easy access. Access: all amenities only minutes away, Avignon and its TGV station 25 min away, and Marseille international airport about 1h away.